From electric bills that hurt our pockets, to long wait times on the phone – the £54bn energy sector can leave us feeling anything but energised. But ever so quietly, the market has changed dramatically. Small and medium sized suppliers have increased their market share from 1% to 24% since 2011, disrupting one of Britain’s largest industries. We looked into the circumstances driving this revolution through related media coverage. Brand image and awareness are vital in the energy sector. Small suppliers have traditionally struggled against recognisable names of the big 6. There’s too much inertia in the system. Recently however, these smaller brands have started to grow their image at a quicker rate than the larger firms. Using data from the Signal platform, we compared the change in media mentions for the Big 6 and ‘the small five’ over the last year. We found that the smaller suppliers are massively outpacing the big players. They’re growing their presence in the media 5 times faster and boosting their brand awareness far faster. Consumer group Which? recently revealed the best energy companies in the UK for customer support and value for money. The results of the survey show the top 5 all being small, lesser-known suppliers. 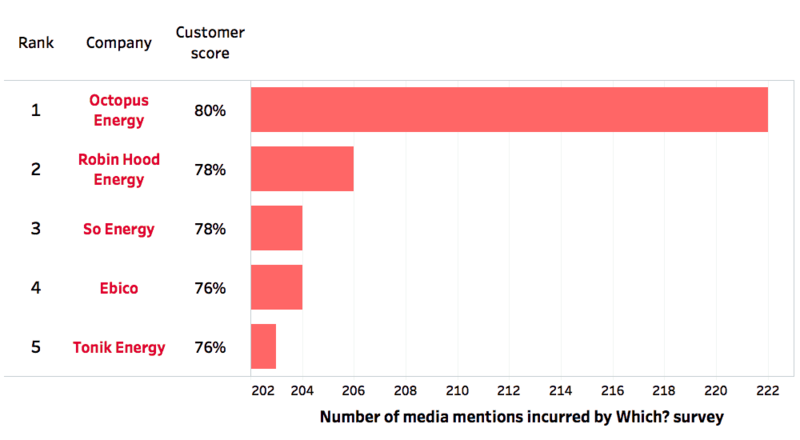 Octopus Energy, which topped the list, achieved the most media attention after the survey was published. The company was mentioned by news outlets such as the BBC, Daily Mail, and Yahoo Finance, with readerships in the millions. As a result of the report, Tonik Energy’s coverage spiked 3000% compared to the total coverage it received the month before. These small firms dominate on customer service, and their efforts are being recognised. Smaller energy suppliers have taken the stage at the perfect time. The barriers to switching are at an all-time low and the austerity-led demand for low prices has doubled switching in just 4 years. In 2018, 19% of customers changed their supplier, up 6% from 2017. This equated to almost half a million customers switching suppliers every month. 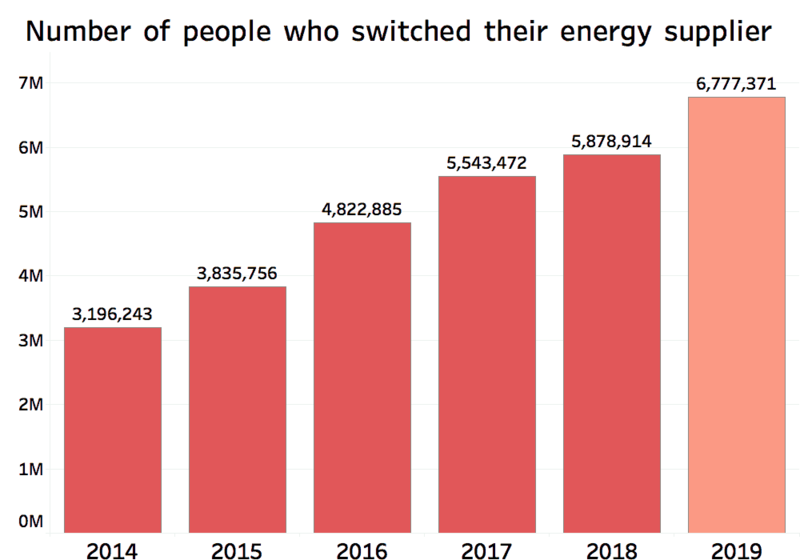 With almost 7 million people predicted to switch suppliers in 2019, now is the time for small energy suppliers to stake their claim on the market. 2019: take-off for the small suppliers? The next 12 months may prove to be a pivotal period for the energy sector. There still remains huge amounts of brand recognition for the big players in the industry, a barrier that smaller brands are only just starting to overcome. The effects of Brexit uncertainties and the new UK energy price cap are yet to be fully realised, but both are predicted to stifle competition in the market. If small firms are able to withstand these obstacles, and continue to expand their brand awareness through mainstream media, then they have their best possible chance of seriously competing with the Big 6. All that’s left to do is wait and see if they can cut an increasingly large slice of that £54bn pie, and electrify a traditionally static industry. Want to discover more about how companies in utility industries might find strategic insights from using Signal? Drop me a line and let’s chat. Also, check out the biggest stories of 2018 in our ‘That Was The News’ report.